Overall this has been a successful assignment” ….I’m pleased with you getting out there with your camera and focusing on groups of people whom you don’t know. Other positives were that there were some good prints of my final edit and the skin tones look much more natural than in Assignment 1. It was good to go through my editing process in the write-up. From the work shown in the assignment I’m likely to be successful in the formal assessment. I had been chatting with subjects, striking up a rapport, letting them know my motives and evincing trust so that they allow me to go about making something interesting. However, I had commented on lack of head and shoulder shots in this series (as opposed to my alternative series at the station in Wirksworth) and the series could have benefited from a good character portrait. “…….the full-length shots suffer a little from seemingly not knowing what they want to be, action or posed”. My tutor suggests two very accurate reasons for this – not taking enough time when making them, plus a desire not to inconvenience them too much. The suggestion here is that once I’ve got them chatting I should ask them to stand where I want, pose them slightly and then make the picture, which should only take 30 seconds to a minute and so not inconvenience them to much. Taking 137 photographs over the weekend is not enough given that I was shooting in reportage style. More, possibly double this would allow more choices. I think what’s happening here is that I’ve been influenced by all those articles/comments which say that if you’re making good photographs you shouldn’t need to take a lot. I realise I’m really putting the cart before the horse here because my photographs aren’t good enough for that attitude yet so I’ll just have to keep on taking lots of them! The editing lets me down a bit from a professional standpoint. Two of the photographs are basically repeats. The young man on the shed is in the group photograph and then I have two close-ups of him doing the same activity (laying the roof). It would have been better to have left the first one in my contact sheets (where he semi-posed and smiled). In fact, I was going to leave it and only included it at the end because I had to exclude one of another subject wasn’t good enough. What I could have done was to wait until later and take a shot of the young man when he was used to my presence and doing something else. Another man in the group shot is hoeing and then I have him doing the same thing in an individual shot. My tutor doesn’t see that as a problem as they are very different photographs but he comments that if I was doing a piece for a local magazine or paper then they wouldn’t want to run two pictures the same, but would want both to be shot so they could choose one of them. Do you know that’s something I was thinking during the editing process – “If only I could just give the contact sheets over to someone and then they could choose what they want – like the way people choose their wedding photographs!” I enjoyed the editing process but it was fraught. Of course, if I’d taken more photographs then at least I would have had more to choose from that were, hopefully, ‘good enough’. Excellent overall. My write-up of the alternative assignment shows I’m going the extra mile. Suggestion that I include more links to what I’m reading and viewing. I’m aware that I hadn’t been doing as much reading (due to my sinking into gloom at the beginning) but that has increased in past weeks. In fact I’m beginning to lose track slightly on recent books I’ve bought and ordered from the library so the pile is growing. Also I had been in the habit of doing hyperlinks and references within the body of the write-ups and then listing all the references again at the end. I’d stopped doing the latter but will go back and amend that. I also have a separate ‘page’ which for some reason appears at the bottom right of my blog which is “Bibliography and References” so I can keep overall track of reading etc. Having read my tutor’s feedback I realise I haven’t updated it at all so that will have to be done. I’m not too sure about including all the website links I’ve followed for posts there though. I think I’ll ask a tutor question on the OCA site. Lots of suggestions here on ‘People at Work’ ; “People and Gardens” and “People in Buildings”( remembering the next assignment). These are – Keith Arnatt,; Lee Friedlander; Fay Godwin; John Darwell and Stephen Gill. I’ve accessed all of sites once already – now need to go back and look in more depth. Also suggestion to look at Magnum Contact Sheets, Thames & Hudson to look at how the best photographers ‘work’ a scene. This is on order from the library, in view of the high cost of buying. If I like it sufficiently it can always go on my Christmas present list! Remember to get variety of activity in photographs – as in the case of a group shot followed by an individual one. Make some notes for my paper log on the photographer series I’ve been linked to – plus I can safely download examples without breaching copyright. Update my ‘Bibliography and references” list on Pages in my blog. It feels as if quite a lot has happened but I’ve progressed very slowly. I completed Assignment 1 back in June but then got stuck. Looking back now, it was partly because I had this block about photographing people (particularly for ‘portraits’) and I think that also I was still hanging on psychologically to AOP. What happened from there was that I became more deeply interested in photography as art and started to read quite avidly. This was good, but it meant that actually taking photographs took a bit of a back seat. I had completed all the exercises and also gathered images for Assignment 2 but then there was preparation for the OCA Student Residential Weekend in Leeds at the beginning of September. We were asked to take a set of prints connected with a current project, either personal or OCA, for the Portfolio Review group. I’ve had a personal project on the back burner for a year because there seemed too many potential themes emerging for me to get focussed, so I decided that it would be good to use work I’d done for the portfolio review. The weekend was both enjoyable and stimulating and I have already written a brief post earlier on aspects which struck me (fuller notes are in my paper log). With a clearer head I’ve been able to focus on getting Assignment 2 together. In the previous post I laid out the first possibility but have decided to go for some later work in the hope that this will show some development in technique and also confidence. A major difference is that, this time, I interacted much more with my subjects. The assignment brief doesn’t ask for that but I knew that this would help my confidence level. I have to do this over again because I do keep losing the essence of it. Produce a set of approximately 10 final, selected images (the same person or small group at different kinds of activity, or different people at the same single activity or event. Concentrate on two aspects : telling moments and ‘explaining; the activity (which means choosing viewpoint, framing and timing to make the actions as intelligible as possible). For the past ten years the village has held an annual Garden Safari over a weekend in June. 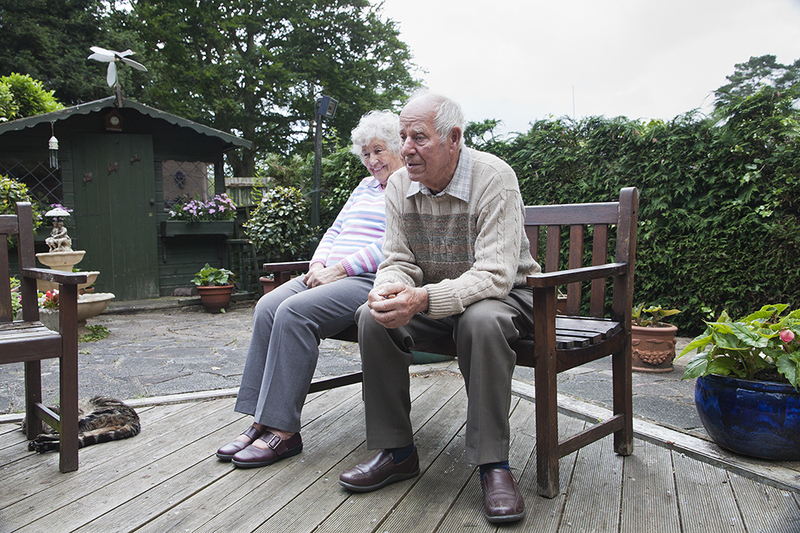 Local residents open their gardens to the public – all shapes and sizes and plantings. Cream teas are offered by some and plants are often for sale. Entry is gained through the £5 purchase of a leaflet which informs you of names and addresses of the gardens concerned; type of garden and on which day they will be open. The money raised goes towards the Village Hall refurbishment fund. Last year I visited several for the first time and was particularly fascinated by the local allotments and a local garden maintained by a retired landscape gardener and his wife (I’ve changed any names mentioned). I decided to visit again this year to see how everything had fared in the poor weather we had experienced so far. I also wanted to see if I could improve upon the images I took when I visited Wirksworth in terms of framing and composition. I will be sending my tutor contact sheets (5×5) containing all the images I took, together with the ones processed so that he can see my choices and any processing decisions I made, including cropping etc. 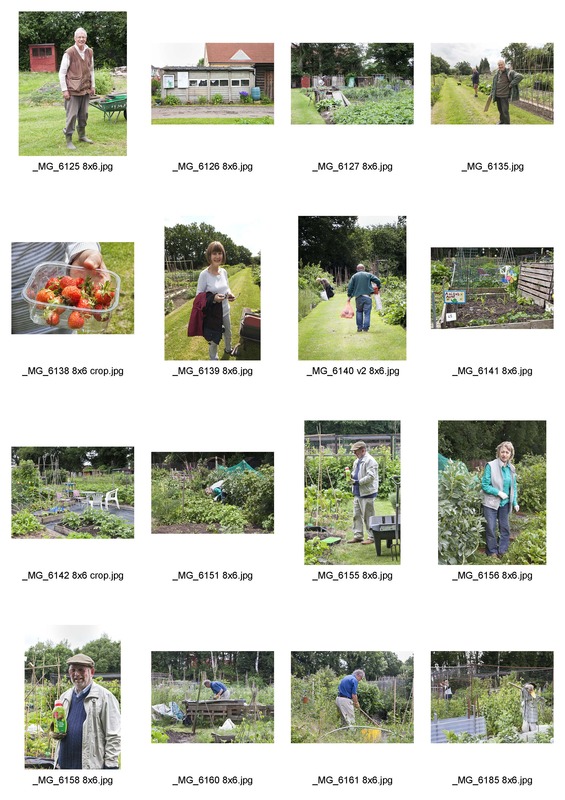 The photographs were taken on two separate days at two allotments and one garden. 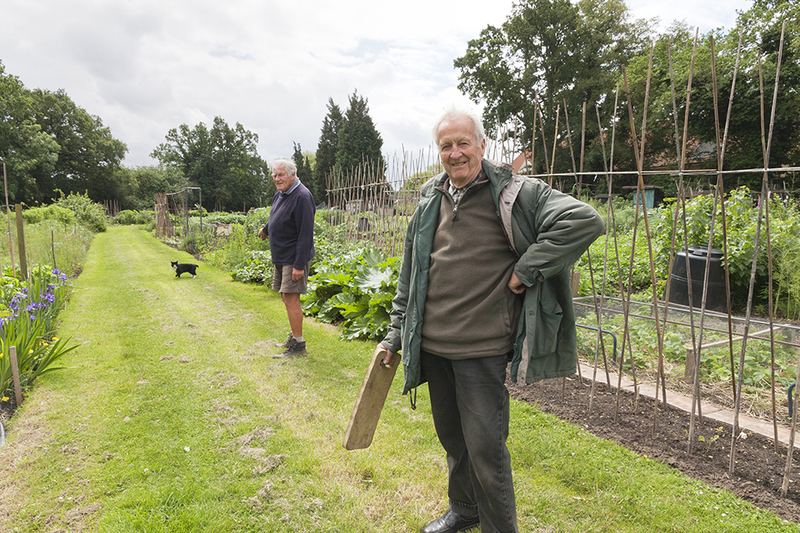 One allotment had only just opened and is the first new one for more than 25 years, the other one has been in existence since 1917 . It was another weekend of sun and clouds that created difficulties with working out exposures, particularly when clouds were moving fairly quickly. I generally seem to be attracted towards greenery which, of course, affects white balance. I made my initial selection from 137 photographs taken over the weekend. 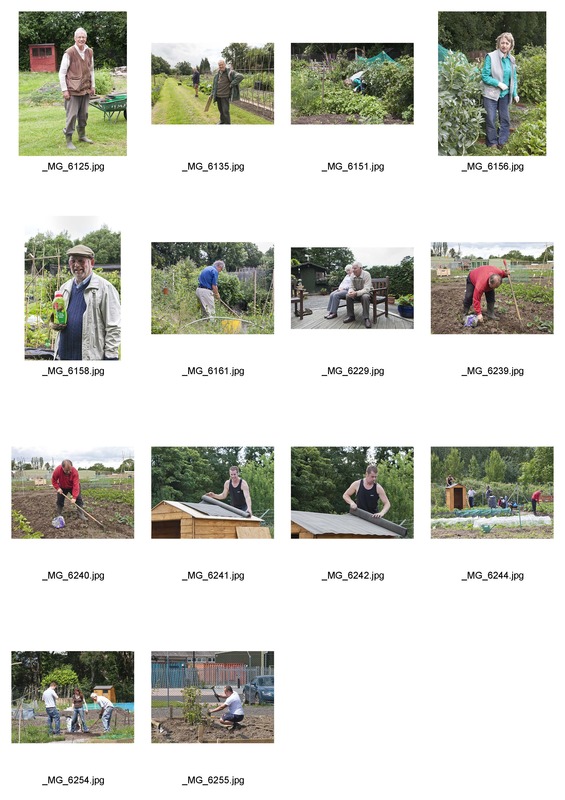 On looking at the full contact sheet I realise how my attention was veering between wanting to capture the essence of the gardens and allotments and the people working them. I also noticed that, unlike at Wirksworth, I wasn’t taking many head and shoulder type close-ups. Understandable I suppose when gardening usually involves the whole body. Unless you’re planting out pots of course. Four of them (6126, 6127, 6141, 6142) were of the allotments but not people, although there are traces of people there. I’d originally included them because they showed context. 6138 was the strawberries held by the lady in 6139 – they showed one of the outcomes but nothing of the activity itself.. 6139 had been taken at my camera’s widest focal length (15mm) and I decided it was too distorted. 6140 was at too far a distance I decided, especially as it was a back view. I chose 6161 against 6160 as one can see more of the activity involved. I thought the one of the couple with the rhubarb (6189) was good for context but it looked too sun-dappled. There were three of Mr and Mrs Vincent and I decided that 6229 was the best framing/angle. I then excluded four more. I’d thought the posture in 6151 was quite quirky. It appealed to my sense of humour but it isn’t really obvious what the activity is. Similarly with 6161, the gentleman (a new allotment grower) was using an azada on the very overgrown plot he’d just rented. I’ve never heard of an azada but he said it was very easy to use and easier on one’s back. I initially thought of including 6158 but, when I printed it out the sky bled into the white of the paper. I darkened it but decided that there was also too much shadow in his face. 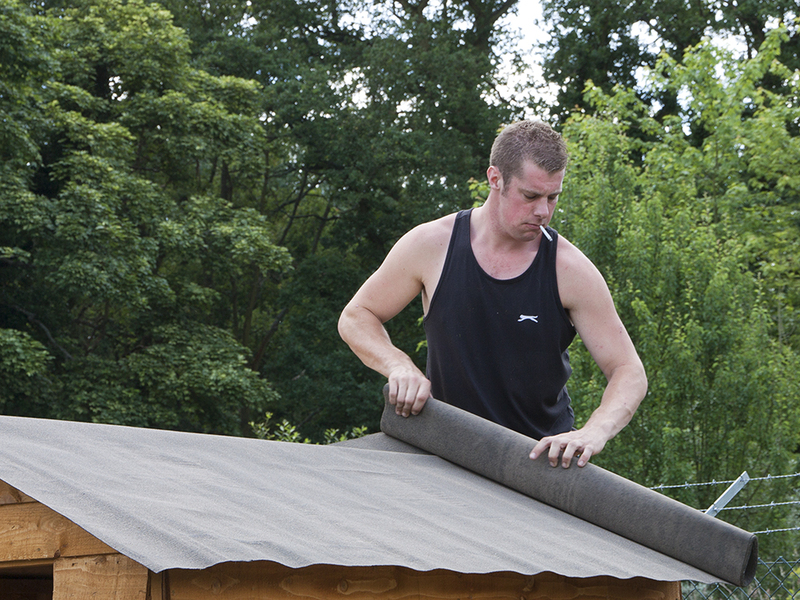 I was really torn between 6241 and 6242 – the young man roofing the new shed. I reluctantly decided to exclude 6241 because in 6242 he was actually engaged in the task as opposed to looking at me but changed my mind later (see below). 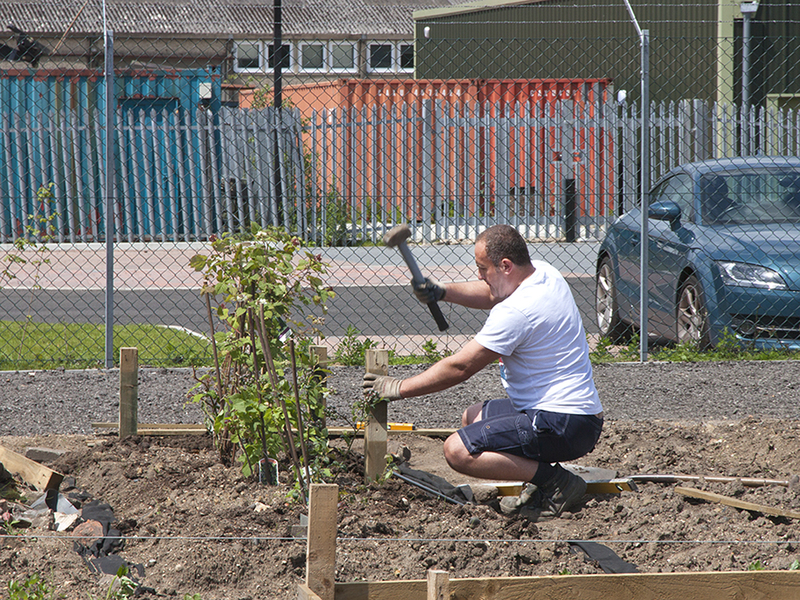 In 6239 the gardener is concentrating on planting so the emphasis is on the action as opposed to his person. I decided that 6240 was the better image because you can see more of his face and there’s also more energy about it. The order I have chosen is not the order in which I took the photographs. 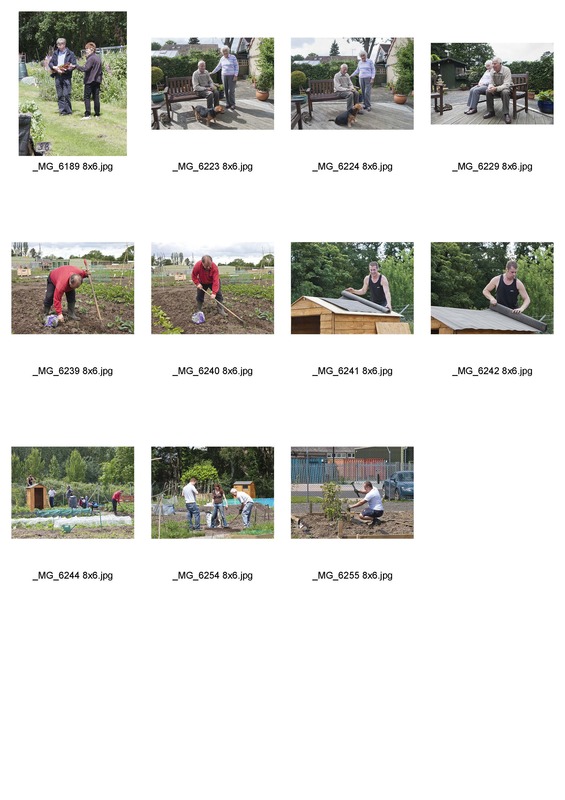 One thing I noticed about the new allotment is that the gardeners seemed to be younger so I’m presenting the photographs as a time metaphor in a sense – younger people on new allotments getting to grips with creating the space and planting; more experienced gardeners reaping the fruits of their labours and a very experienced gardener, wise in years, contemplating his efforts. 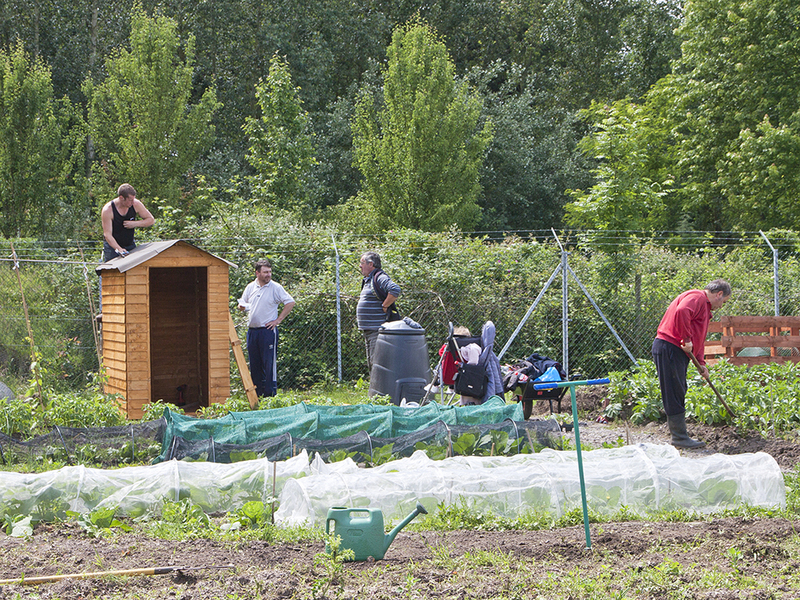 The allotments had been open for 6 weeks and there was a lot of preparatory work being done, including building tool sheds. 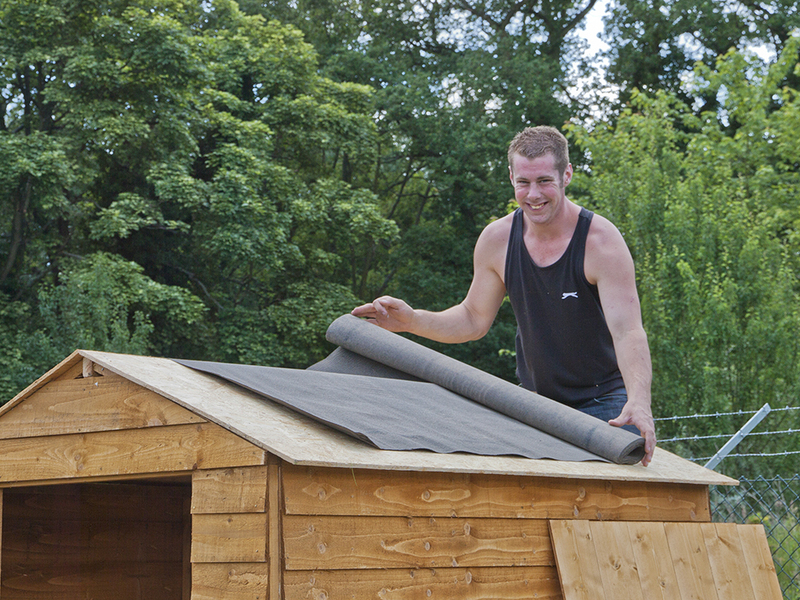 There were a lot of new sheds which I’d thought would be included in the rent, but I was told they had to be paid for. I could have zoomed in closer but I wanted to include more of the context to gain that sense of newness. Also, zooming in would have meant a longer focal length which would have excluded part of the group. I’d asked if it would be okay to photograph him so he posed. It’s f/8 @ 42mm. I think I should have used f/5 or so which would have given a faster speed andmade it sharper. He’s less sharp than the shed and I should also have use spot focus) . I’d kept my camera on multi-focus. Having written that I could, of course, have focused on him, half-pressed the shutter button and then re-focused. I was too aware of stopping him for carrying on with his task. This was a substitute for another image I’d originally chosen. I think it works better. I waited a moment until he was ‘unaware’. I cropped this just to show the roof and to get a diagonal. We had a talk afterwards about the allotment. 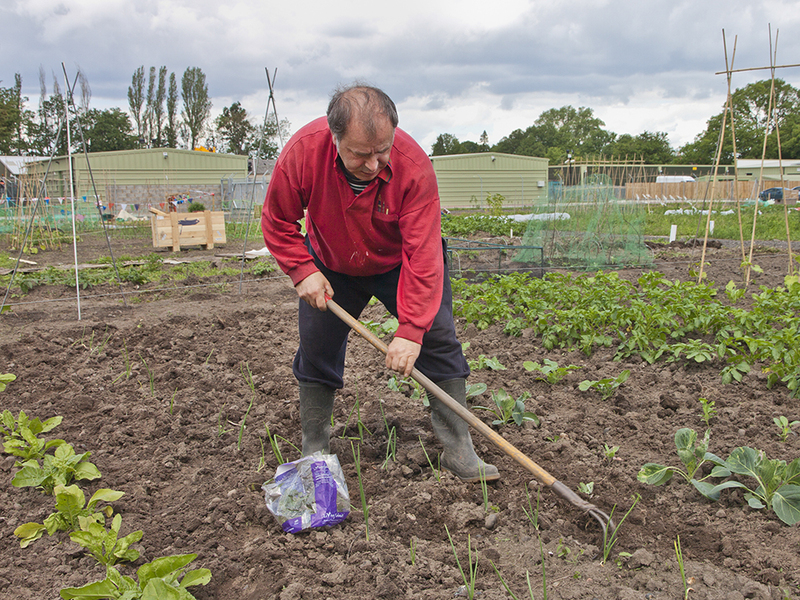 He has a garden at home but wants to grow vegetables on the allotment. The soil looks quite clayey and he told me that the weeds soon take over. Slightly cropped to draw more attention to the hoeing. Nos 2, 3, and 4 are all photographs of the people you can see in No. 1. From there I moved further around the allotment. More small group effort. I wasn’t going to include this at first as there is slight blowing-out on the top of the man’s shirt on the right so that some of the pattern is lost. It’s showing partnership though which I think is important in building something new. Hard work laying out a bed. Should I have taken a closer shot just to show the effort? I keep wanting to show the context but am I overdoing that? 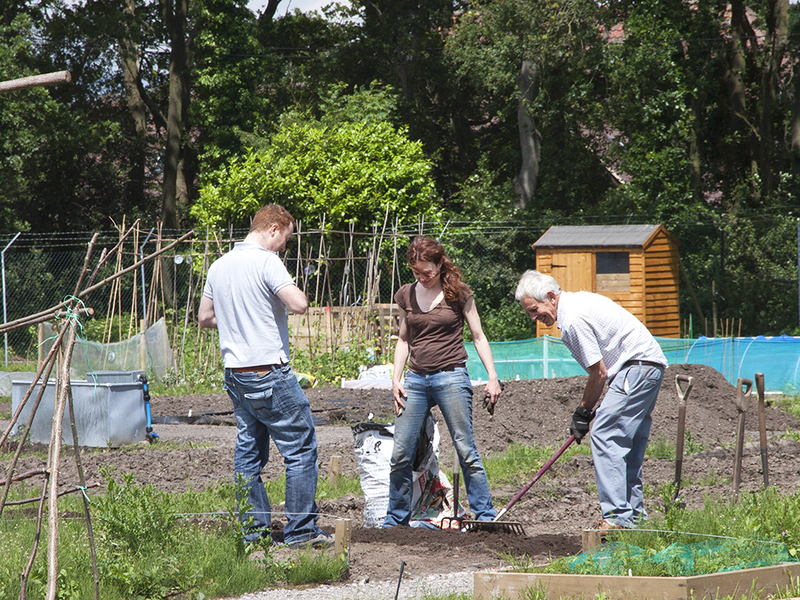 The next images in the series were taken at the older allotment. They were just about to leave so we had some banter backwards and forwards and then the cat moved in just at the right time. I took this for the geometry. 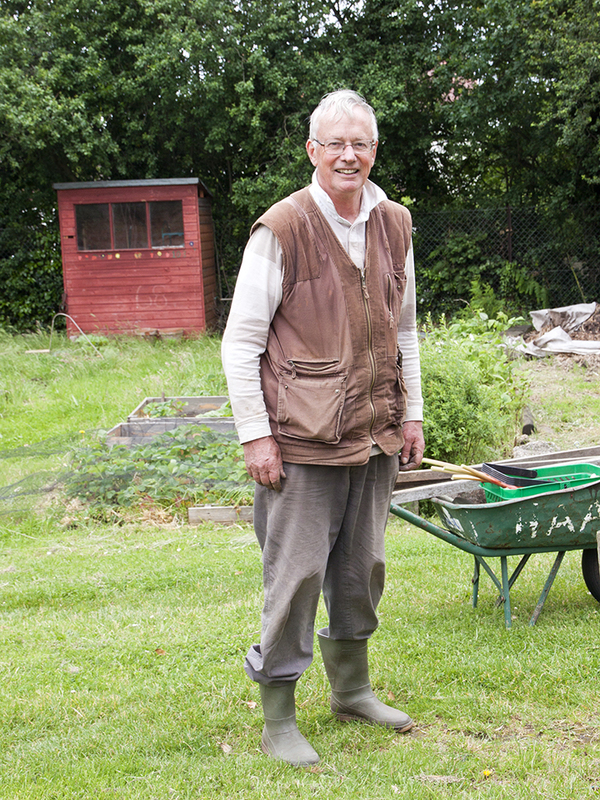 This gentleman told me he’d had an allotment for 7 years, four of them here. He was also opening his home garden on the following day. We had a conversation about deep bed systems which keep away the pests. 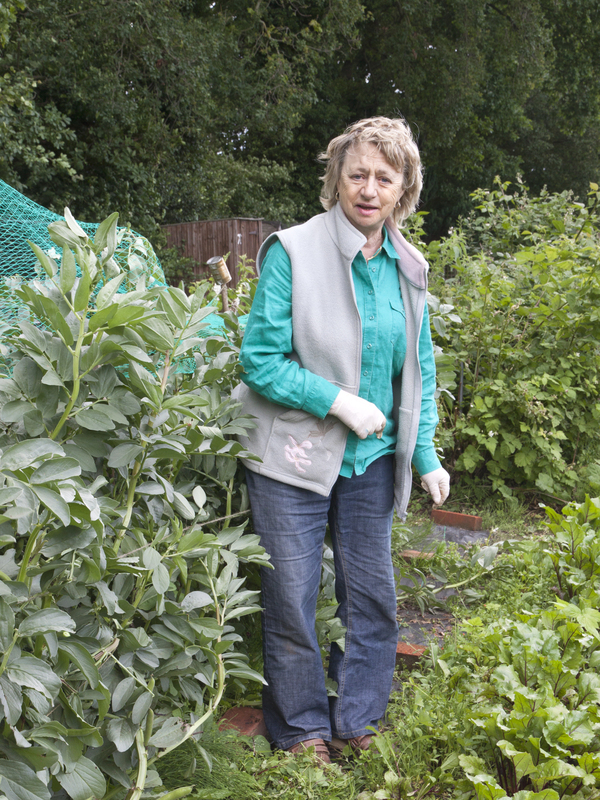 This is Jennifer who has an allotment with her husband Paul. They had to wait 6 years to get it and have been here for a year. They were just waiting on their first beetroot crop. I took this photograph just as she was standing up from some weeding. It works for me because it shows her in an environment she’s enjoying and her face and stance appeal to me. It was taken at f/11 which wasn’t necessary, but I’d not changed it after photographing a row of sheds. A wider aperture would have provided a faster speed but it does look quite sharp to me. Thinking about this now, maybe it’s better to have the camera on TV setting rather than manual and let the aperture take care of itself. The final image is of Mr and Mrs Vincent. This photograph is of a moment of contemplation and quiet concern on Mr Vincent’s part because the poor weather meant that there were less flowers to show. The Vincents have been in the Garden Safari Scheme from the start , but are thinking of stopping now because of the work involved at their age. Their garden is quirky with pixies, fairies, gnomes and all kinds of small statues. This year they’ve also installed some hens so I went to say hello to them. I’m not sure that the quality of the images is better compared with the earlier ones from Wirksworth but I can feel more confidence there in that I was interacting more when appropriate. There’s something about allotments that I love – all the greenery around and the evidence of so much work and dedication to the soil and growing things. I think these photographs speak for themselves but I’m aware of how much I keep wanting to add some narrative – not necessarily because it’s required but because I want to tell some of the story of what I see. The other more technical aspect I need to consider is my inclination to show the context and not being able to decide how much is enough.